The page dots on the homescreen are very useful when you have several app pages on your iOS devices. While they serve an important purpose, having them on the screen all the time is pointless. 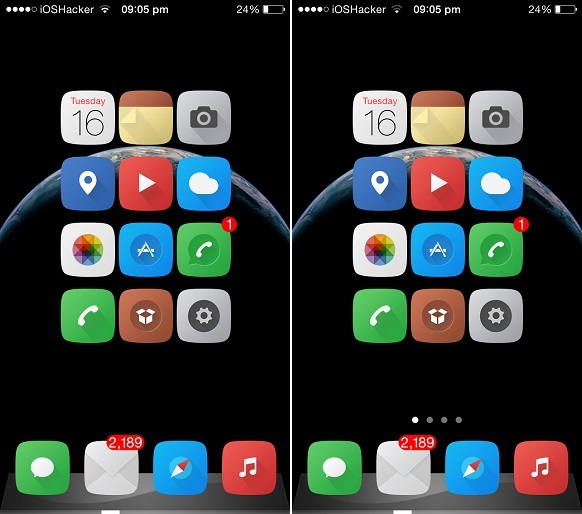 If you are a minimalist who has been using different tweaks to hide homescreen’s page dots you will be pleased to know a new tweak called Shy Page Dots has arrived with a far better solution. Instead of completely removing the page dots from your iPhone or iPad, the Shy Page Dots tweak only hides them when they are not in use. Meaning they will only be visible when you are scrolling on your homescreen and will disappear again when you are done. The dots appear for a few seconds when you perform the slide gesture to jump from one page to another. Once you are done they are hidden again after the interval of one second. Ability to hide the page dots and have them back when needed is what many iOS users have been waiting for. It gives the homescreen a more minimalistic look and brings the useful feature of the operating system back when needed. There are no options to configure for this tweak and it is available in Cydia for free. It requires iOS 7 or above to work.